The following forms are available to managers of 4-H Foundation accounts. Get help choosing the correct expense type on payment request forms. The JUANITA H. FASOLA FOUNDATION, INC. is pleased to announce its Education MiniGrants Program that will be awarded to support innovative projects exclusively for charitable, educational and religious purposes. The Tennessee 4-H Foundation recently concluded the 4-H Grows matching campaign. Sixty Tennessee counties participated in the popular matching gift program. Nearly $150,000 in new local endowment funds where generated by the program. Thank you to all who participated! 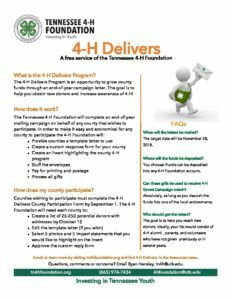 What is the 4-H Delivers Program? 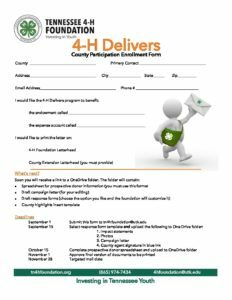 The 4-H Delivers Program is an opportunity to grow county funds through a Spring campaign letter. The goal is to help you obtain new donors and increase awareness of 4-H! How does my county participate? The following 30-second 4-H promotional radio spots are available for download in .mp3 format. They are the property of the Tennessee 4-H Foundation and are free to use in the promotion of Tennessee 4-H programs by UT Extension staff, volunteers, Tennessee radio stations, and businesses who use ads on phone systems, etc. Enjoy!